I got a little drenched in a sudden storm last night. There we were gaping at the incredibly ugly lights for Hari Raya, smoking our shishas, when an unexpected gust of wind trying to audition for a part in The Wizard of Oz, came rushing by and basically blew everything off the tables. It was uncanny. Just an hour or so before, I had the misfortune of having my handbag catch on fire after the charcoal boy dropped his coal right on top of it. As he just stood there and gaped, I had to scream at him to take it out as he fumbled around. Aghast, I watched him picking at it gingerly and slowly with his tongs as my handbag started smoking and flaming. Finally, I got a glass of water and put it out. Fortunately, nothing else was burnt inside my bag. Phew, I was really worried as I had a couple of electronic gadgets in it. Of course the handbag was completely ruined ... a gaping hole the size of a fist had burnt itself into the leather. And guess what? Service oriented Singapore's typical response happened. The charcoal boy did not even apologise and walked away, ignoring me and pretending that he had not done anything wrong the whole night. Of course I was not gonna take this sitting down. Unfortunately for him, the owner is like an uncle to me. So I brought my bag to him and told him what happened. He's going to replace my handbag and of course everyone apologised profusely ... but not the charcoal boy. And people wonder why the Prime Minister's teh tarik speech did not touch anyone. Immediately after this, a friend got really upset when she realised that a critical piece of work for an important client had been royally fecked. She'd handed the project to a good friend and the end result is ... shall we say, even my cross-eyed, arthritic and colour-blind third cousin's nephew could do better. She was understandably upset. But I think even greater than the anger, was the betrayal and hurt of a friend betrayed. Everyone felt her pain and we totally commiserated when we saw the work. So it was a strange group sitting there smoking our shishas and trying to cheer each other up despite our individual small and not-so-small setbacks last night. We cracked jokes, made corny comments and generally clowned around. The words, "Using laughter to hide your pain," flashed through my mind. And as if to mirror the turmoil within, the skies opened with a flash and a tremendous sleet of rain pelted against the aged bricks of the shophouses. The rain was so strong and sudden that someone remarked that it was a Katrina Wannabe. By this time, I had decided I should bugger off home before anything else went wrong. And my friend wanted to watch a movie to get her mind off her troubles. And these were considerable. Let's just say fecked up work, deadline on Monday, important client with contacts to all her other clients, and recalcitrant ex-best friend aka Creator of Fecked Up Work ... all these do not make for a very good weekend for my poor friend. But we couldn't leave as the rain was so strong none of us would have been able to make it out anywhere without getting drenched. I managed to borrow an umbrella. But the rain was so strong that I still got drenched even in the short dash to the taxi. The nice taxi driver was so sweet. Seeing me looking like Shakira in one of her videos where she (again!) gets wet ... he decided to drive as fast as he dared in the downpour. He also turned down his air-conditioning and asked if I needed a jacket. Awww ... now that is service. So, I slept a little .. OK, a lot later, than I planned. When I awoke I was kind of worried that I might catch a cold from the drenching last night. Even though I had taken a very hot shower and had huddled under my duvet all night, I wanted to make sure I was not going to fall prey to any flu or cold. I'd enough of that from my dengue scare. I thanked my lucky stars that I had the herbs required for Frog Soup with Ginseng, Saffron and Tian Ma. This soup is good for a number of reasons but the biggest benefit is that it wards against flu. It apparently reinforces your heart, liver and stomach's ability to function at optimum and strengthens the gastrointestinal functions. However, either I've read the books wrongly or mistunderstood the instructions but apparently, you cannot drink this soup between 11am and 1pm. I have no clue why, but fortunately, I was planning to have this for dinner anyway. The Chinese herbs required for this are quite common but the frog was a bit suspect. I have never cooked frog before. I've eaten it many times and theoretically I knew how to cook it. But I've never been that crazy over it so never gave it much thought. I could not find any frogs in the market but they had frog legs. I reckoned it really made no difference so I bought a fair sized packet. You need saffron for this soup and this is quite unusual for me to see in a Chinese recipe. Saffron is definitely no stranger to me as we use it in our curries and paella at home but I have seriously never seen it in Chinese cuisine. 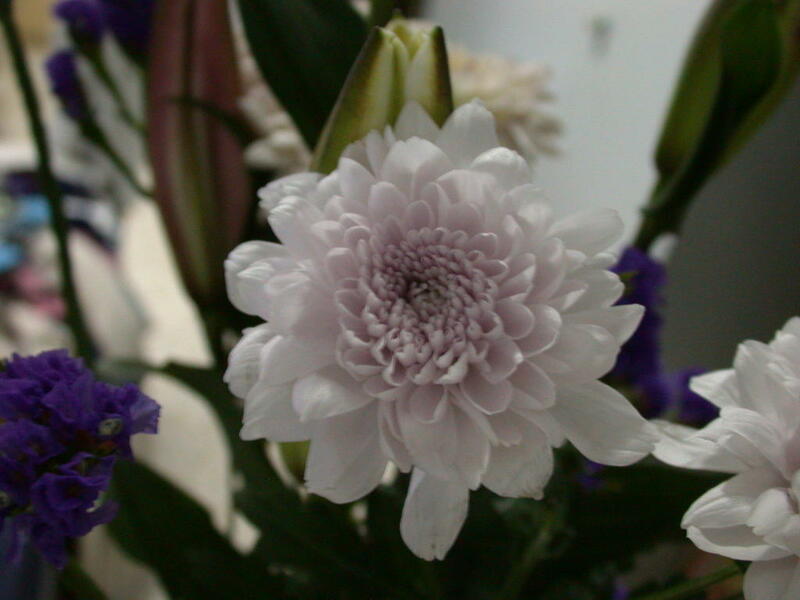 Perhaps, this may be because they call it xi zang hong hua which essentially means Persian red flower. Explains why it was used fairly often even if not weekly, in our food. It is an expensive herb but a little of it goes a long way. However, this recipe asks for quite a lot - about 15g. If you use this, get it from a Chinese medical hall and not from a spice rack. 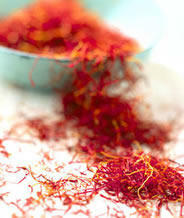 Saffron regulates the heart and liver, and such being the case, also aids in enhancing your blood circulation. It is said to have the ability to remove blood clots and stagnation so women who have painful menstrual cycles would benefit from this herb. It is also supposed to help in hair growth. If I had any more hair, my hair salon would close its door to me. At the last visit, the poor colourist assistant was heard gasping ... "Wow, it's like I never run of out hair .. I keep combing and combing and still there is hair ... it's so long!" She's Malaysian. They tend to be flamboyant ... LOL. Being so used to saffron, I did not realise how rare it is till Nishi told me she had never had it. It is a lovely herb. I love the bright red luster of it when it is uncooked, and the yellowish orange glow it imparts to all that comes into contact with it during cooking. However, this lovely herb is potent and has to be taken with care. You should not take too much of it - which is lucky since it is so expensive. Preggers ladies should not take this herb but then again, as I say time and time again, preggers ladies should not be taking Chinese medicine in the first place. Also, people who are on blood-thinning medication should avoid saffron as well as ladies with very heavy menstrual periods. The other herb is American ginseng aka xi yang shen. 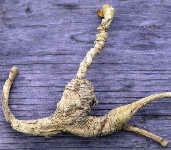 Different from the Korean ginseng which is deemed heaty, the American ginseng is considered cold in nature. So in this soup, it helps dispel heat and nourishes your qi while helping relieve dry throats (something I need), nourish the lungss and the stomach. The last herb is gastrodia tuber which is known as Tian Ma. Tian Ma is also known as Dong Ma and is warm in nature. It dispels wind (stand back now), cures palpitations, and nourishes the liver. Apparently it is also good for dizziness and numbness of the limbs due to inner wind, i.e. rheumatic numbness. Once I had assembled all my herbs, I got to work. The soup is actually quite mild in taste and I was surprised to find I rather enjoyed it. However, the frog legs were just OK and again reinforced my opinion that they are rather average and nothing much to shout about. I just do not get the whole frog leg craze. So healthwise, this soup gets a 9.5/10 and taste-wise, about 8/10. I had the soup with rice and experiencing a rush of guilt as I have not eaten as much vegetables or fruits this week, I decided to stir-fry some kailan with garlic and oyster sauce. It was a simple dish. I just sliced up two garlic cloves and sliced up the thick stalks of the kailan. I sauted the garlic and the sliced stalks in peanut oil before adding the kailan leaves. 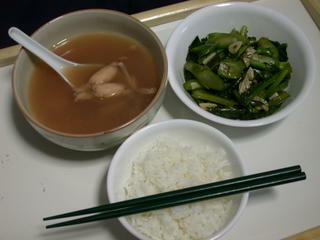 After cooking for about 1 minute, I added oyster sauce flavoured with dried scallops for synergy with the soup. After 2-3 mins till they are cooked, I turned off the fire and plated. I was quite happy with my meal so I felt justified in having a cream puff for dessert. 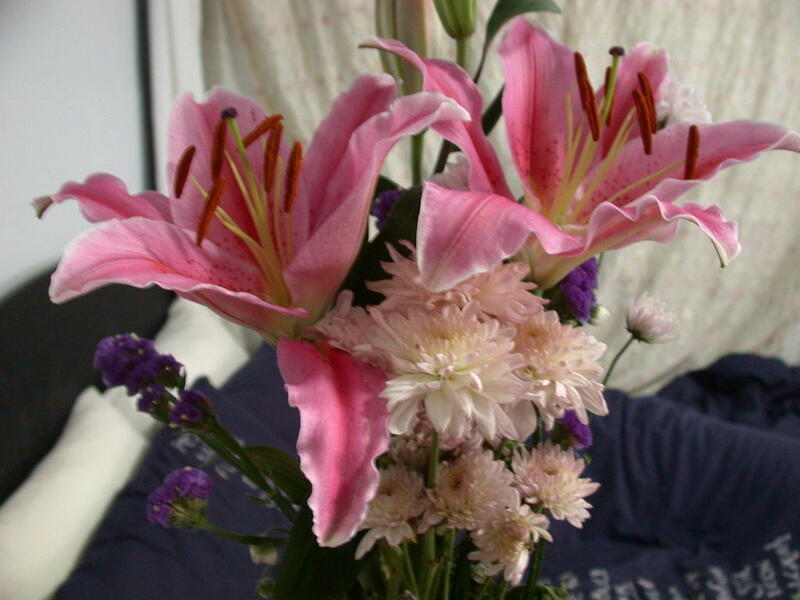 While eating my dead delicious cream puffs from Bread Papa, the fragrance from my lilies, which finally bloomed, wafted across my nostrils. Let me tell you, it takes quite a lot to take my attention from those cream puffs but I did get distracted. So I decided to take some shots of the flowers. They are gorgeous and now I am inspired to search for my bigger flower vase tomorrow.